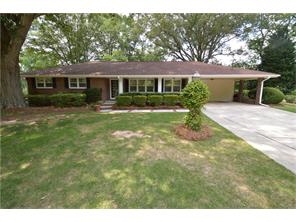 3 Beds 2 / 0 Baths 1,944 Sq. ft. Description: Lovely Sprawling Brick Ranch in Lakeside High, on a beautiful lot on cul-de-sac- sac, Well designed open Floor plan connecting Sun Room w/ French doors, Large Den w/ fireplace and Eat in kitchen w/ Island, hardwood floors, 2 yr old Architectural Roof with Leaf guard Gutters, Updated Sewer line replaced w/PVC piping, recent plantation shutters Installed, Fenced in backyard with mature hardwoods, Large laundry room on main level with extra storage cabinets, Lower Level includes home office, workshop and Playroom, New Exterior and Interior Painting.